What better seasonal look that the quintessential jack-o-lantern? Did you know how the jack-o-lantern became quintessential? We do! Because, well, our employer requires this sort of knowledge of us in job interviews, let alone on the job. Since you asked, the original jack-o-lanterns weren't pumpkins at all. They were turnips, gourds, and potatoes carved by Irish folk to pay tribute to welcome spirits and scare off evil ones. The tradition followed colonists across the sea, and as they settled and discovered new things, they were introduced by Native Americans to a plant that worked even better for this purpose: the pumpkin! Alright, history lesson over. All due respect to those other veggies, we can't imagine the jack-o-lantern as anything but a good ol' orange pumpkin. Its color grabs your attention, its size demands your awareness, its gross orange filling begs you to rip it all out. We can’t say with authority how effective they might be at warding off evil spirits, but we can attest that they’re excellent at making us feel right at home on a late fall evening. 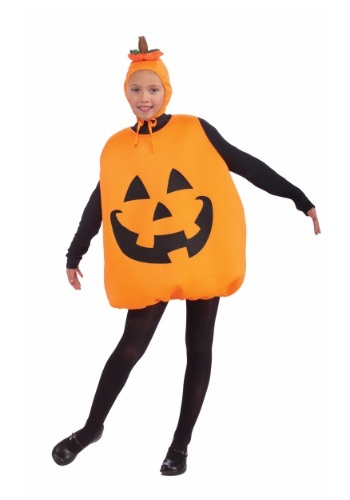 This autumn, your kid can celebrate the noble pumpkin in this loose-fitting polyester jack-o-lantern costume. With a fun carved-out top hat and a smiling, snaggle-toothed face, it looks about as friendly as a vegetable designed to chase away Halloween ghosts could possibly be. If you wanted to be more traditional, we suppose you could try to track down a grinning turnip costume, but we kind of suspect you’ll have a tougher time with that. Take our word for it and stick with the pumpkin.